A potent daily supplement of vitamins, minerals, and antioxidants to support health and well-being. 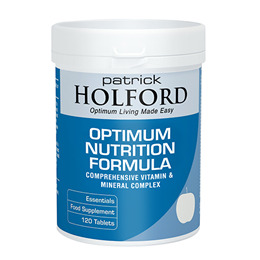 Optimum Nutrition Formula provides optimum amounts of essential nutrients including vitamin A, B complex, iron, zinc, selenium and chromium and is particularly high in calcium, magnesium and vitamin D. All ingredients are provided in a high quality, bio-available form for maximum absorption and utilisation. 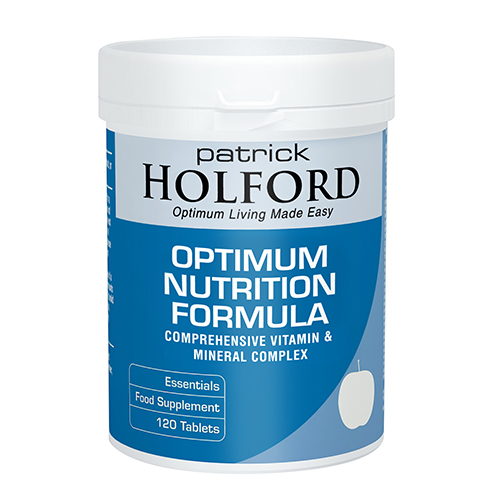 Optimum Nutrition Formula is suitable for daily use and may be especially helpful for those with a higher requirement for nutrients or simply to ensure an optimum intake of vital nutrients to support general health and well-being. All ingredients supplied in their bio-available forms. Take one tablet twice daily with food, or as professionally directed. This product should not be used as a substitute for a varied and balanced diet and healthy lifestyle. Do not exceed the stated recommended daily intake. Do not purchase if the seal is broken. Keep out of reach of children. If you are under medical supervision, please consult a doctor before use. This product contains vitamin A. Do not take if pregnant, planning a pregnancy or breastfeeding, unless on the advice of a doctor or antenatal clinic. Long term intake of amounts greater than 10mg of vitamin B6 daily may lead to mild tingling and numbness. This product contains iron, which, if taken in excess may be harmful to very young children. Below are reviews of Optimum Nutrition Formula - 120 Tablets by bodykind customers. If you have tried this product we'd love to hear what you think so please leave a review.